Online gambling company Sportingbet has said that outstanding arrest warrants for its executives, issued by the state of Louisiana, have been cancelled. 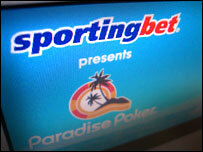 Sportingbet was one of several online gaming firms that quit the US market after its operations there were effectively made illegal. It sold its US business in October for $1, before new laws came into force. Former chairman Peter Dicks was arrested in New York last year in a clampdown on internet gaming. He was released when New York Governor George Pataki declined to sign a warrant extraditing him to Louisiana. "All related warrants issued by the Louisiana State Police have been cancelled with immediate effect," Sportingbet said in a statement. For many gaming firms the US had been a vital source of revenue. Consolidation among European betting operations is expected since the withdrawal from the US market, and Sportingbet is now in talks with Austrian online bookmaker Bwin. Separately, the European Commission has demanded that Denmark, Finland and Hungary should change the rules that limit sports betting in their countries. The Commission is threatening to take legal action if the rules are not changed within two months. It says it has received complaints that the three countries effectively block companies based in other EU member states from doing business. The Commission cites restrictions such as the requirement for state concessions or licences and limits on advertising.